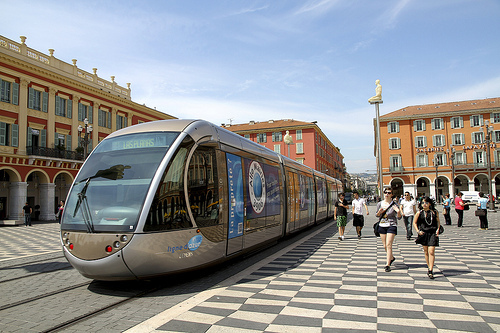 If this is your first time in Nice, taking the tram is a cheap and efficient way of getting to know the layout of the city. 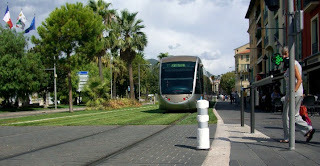 At this time there is only one tramline that runs through Nice but it seems to hit all of the major arteries. Since the tramway first went into operation in late 2007, you can see a remarkable difference in the way it has revitalized various neighborhoods in Nice. Areas that seemed previously unexplored appear to be much more vibrant and alive. I recall avenue Jean Médecin, one of the main locations where the tram now goes through, being a major route for all sorts of traffic before and quite honestly, in the early 1990’s that avenue seemed polluted and dare I say even grimy at times. Well that doesn’t seem to be the case anymore, avenue Jean Médecin is now far more pedestrian friendly and clean. If this is what “going green” is all about for the environment, then I’m all for it. 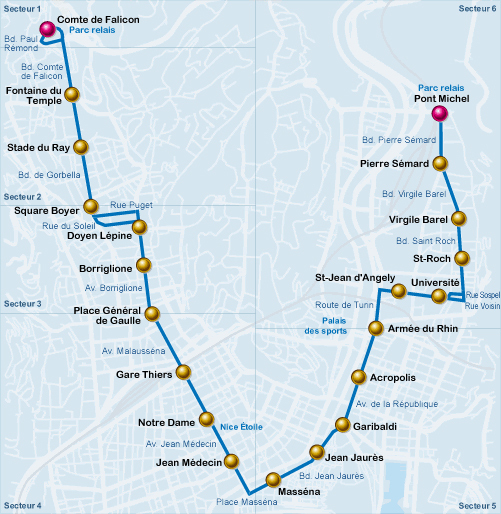 The current line runs in a U-shaped route from Comte de Falicon (Nice Nord) then down through the city center (avenue Jean Médecin) to as close as a couple of blocks away from the beach (Masséna Station) then back North to Pont Michel. Stopping at a total of 21 stations, running almost 9 kms long. You can purchase your ticket for the tram at any of the stations along the route from one of the automated ticket stands (in a variety of languages) for 1 euro, one way. Tickets are also cheaper if you buy them as a weekly pass. A monitor above the station will indicate the route the tram is going and approximately how long of a wait you will have, they do come by quite often and start running from 5:10am until 1am. Always hang on to your ticket, once you step on board the tram, validate it at the automated ticket box usually located near the doorways inside the tram. It is important you do this as ticket officers routinely come on board and will check that your ticket is valid, if not you will get fined. Also, do not buy your ticket from someone on the street. I have found the tram useful for when I want to get to the train station quickly or if I am heading off to a club at night, plus it’s cheaper than a taxi. 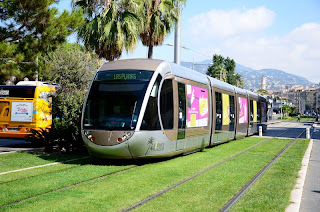 The tram is a safe way to get around Nice. 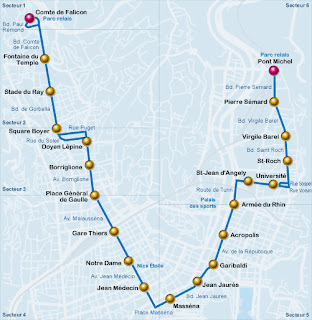 As of March 2, 2011 you can now purchase a Carte Azur for 45 euros for a month pass which gets you unlimited use of the buses and tram regardless of distance traveled and as often as you want. If you plan on staying a year, you can purchase a Carte Azur for 365 euros, which breaks down to 1 euro per day. This pass is good for 27 municipalities around Nice, 16 municipalities around Antibes and the Principality of Monaco. Also, after I’m sure much debate on costs, etc., a second tramline will be constructed. The route will connect the airport to Place Masséna; it will also head part way underground to Nice Port and up to the city’s northern suburbs. Construction of the second line is due to be complete by 2016. As of May 3, 2013, the cost to take the tram or the bus goes from 1 euro to 1.50 euros. Still not a bad deal when comparing that price to other cities.